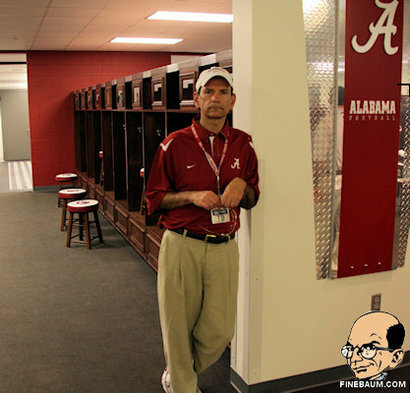 Finebaum humps the meme again. I give him credit for coming up with some new wine in an old bottle – the reason “class guy” Mark Richt in on the hot seat, or as Finebaum puts it, “a sneeze away from being in grave trouble”, is because he “has lost favor with the fans for antics and failed stunts”. My only question is, when is ‘Bama just going to go ahead and send him out recruiting? He’s already got the outfit. Who knew ESPN had a sense of humor? Craig James, the ESPN analyst who threatened to sue Texas Tech if it didn’t fire Mike Leach, will continue to have an active role in the network’s college football telecasts this fall. UPDATE: I guess I could add this. Grab a plate and move along. This is why I’m loath to post speculation about expansion possibilities. On the other hand, I’m definitely amused by Dennis Dodd’s whining about the lack of confirmation of the latest stupid expansion rumor. Jim from Duluth posts his invaluable SEC TV projections for 2010. As I suspected, there appears to be a lot of night in Georgia’s future this season. ESPN appears close to having a replacement Orange Bowl sponsor for FedEx. And with a nifty matching color scheme, to boot! Georgia looks like it’s holding its own on the early commitment front, even with the staff changes. There are a few new entries in the Lexicon. Jerry Hinnen gets my schwiing! award this morning, for this post on a subject near and dear to my heart – regression to the mean. It’s a fun read (even if it’s filtered through an Auburn perspective) and at least you’ll know where I stole the idea from when I do something similar on a really slow news day in July. For the post you’re reading, though, I’m changing the focus to look at one narrow area – turnover margin – filtered through the lens of the entire conference, to draw some conclusions about why this should matter if you’re a Dawg fan. … With certain exceptions (almost all of which are named “Pick-Prone Quarterback”), turnover margin appears to be almost entirely random and sees huge fluctuations year-to-year. If you want specific evidence of that, here’s a chart of SEC turnover margin by team for the years 2002-2009. There’s only one team on that chart that’s managed to stay in the black every season – Alabama. Similarly, there’s only one team that’s finished in the black only one time – Mississippi State. Most of the story there is one of random fluctuation. The second reason this matters is because when it comes to wins and losses, turnover margin is kind of a big deal. Back in 2008, Matt Hinton took a look at a variety of statistical categories to measure their relationships to won-loss records and found a significant correlation between turnover margin and winning. So, it’s somewhat random and it matters. It’s not like a head coach can game plan a season by saying that he’ll have his team go plus-nine in turnover margin; however, if you’re faced with managing a quarterback derby, it’s probably wise to insist on going with the hand that’s the least Coxian, all other things being relatively equal. Nonetheless, there are a few observations worth drawing from that chart worth noting. While it’s possible to play in the SECCG without having a positive t/o margin, it’s highly unlikely. In fact, in that eight-year period, it only happened twice – ’06 Arkansas and ’05 LSU. Both of those teams lost. On the flip side, every SECCG during that time had at least one participant that finished in the top two in the conference in t/o margin. There’s been only one season out of those eight when there wasn’t a team with a turnover margin in double digits, either plus or minus (2004). But it’s not as if many teams generate big t/o margin numbers in a given year. The most double-digit tallies to have occurred in one season was four five, in 2002. That being said, no team with a positive double-digit margin finished with a losing record in those eight years. Three teams (’02 UK, ’08 S. Car. and ’09 UG) out of eight with negative double-digit margins won more games than they lost in that time. Oh yeah, that minus-16 from last year’s Georgia team, there are a few things you can say about that. The first, and most obvious, is what an anomaly it was in comparison with the other seven years. During that stretch, Georgia had never gone through a season with a lower t/o margin than minus-three. … Georgia dropped from having the second narrowest range to the eighth. Making things even worse, all three of the teams with bigger ranges did so with much higher plus years than Georgia’s best (+11 in 2003 and 2005). Not good, in other words. Except for one silver lining – if you’re convinced about the effect of regression to the mean, it’s hard to see how Georgia repeats the results in 2010. That last year’s number is so out of the mainstream (for Georgia, at least) suggests that the probability of a more favorable result this season is even likelier. That can’t hurt. UPDATE: I almost forgot to mention that there’s some great work on turnover margin at College Football Resource that covers an earlier period (with some overlap) than the above data. Here’s the SEC breakdown from 1998-2006. And just for a hoot, check out Southern Cal’s numbers over the same period. The last three years? 2, 7 and 0. If you’re looking for a reason for USC’s drop off in dominance, that’s a pretty good place to start. UPDATE #2: Jerry checks out my chart and comes up with a nifty observation. What kind of record would you foresee for Georgia this season if the Dawgs merely broke even on turnovers?